We found 41 different types of goals. You only need these 2. Setting life goals can be a challenging task. Not only because you need to figure out what you want to do with your life, but also because the available information about different types of goals can be really confusing. If you search the web you will find out there are all sorts of goals. It is full of different articles describing different versions of “there are X types of goals and that is what you need to do”. At the end, all the variety can be really overwhelming and confusing. However the fact is this can be really simple. We made a comprehensive research on the web and gathered the most popular types of goals. In this article, I will summarize the information going quickly through the most popular of them. Then I will show you how they can be combined in a simple way so that all the complexity and confusion is avoided. At the end, you will have ONLY two types of goals and this is going to be everything that you need in order to start setting and achieving your own personal goals. If this list looks way too long or you are familiar with these types of goals you can go straight to the point to check the two types of goals by clicking HERE. End goals define outcomes where you’re unwilling to compromise. They describe what you want and should give you direction in your life. Their purpose is to motivate and inspire you. Means goals define one of the many ways to reach your end goals. You can figure out what are the different means goals that will help you achieve your end goal and so choose your own path to follow. The names of those are pretty self-explanatory. A long-term goal is something you want to do in the not so near future. Long-term goals require time and planning. They are not something you can do this week or this year. Long-term goals usually take at least one year or more to achieve. On the other hand, a short-term goal is something you want to do in the near future. That means today, this week, this month, or by the end of this year. A short-term goal is something you want to accomplish soon. A short-term goal is a goal you can achieve for at most 12 months. “When we picture our future, we have an ideal in our minds in terms of what kind of progress we want to achieve in all kinds of different areas. The purpose of the ideal is to motivate us emotionally. It’s exciting to move into a future that we see as bigger, better, and more rewarding, guided by the ideal experience or picture of what we want to achieve. It’s important, though, to recognize that the ideal is not a measuring stick and is meant only to inspire and “illuminate” the path ahead so we can see what our goals should be. This is just a short quote from strategic coach blog and I highly really recommend. The term ‘Big Hairy Audacious Goal’ (BHAG) was created by James Collins and Jerry Porras in 1994 in relation to setting goals for your business. With time this type of goals started to take place in setting personal goals. A BHAG is usually a 10+ year visionary goal that describes your future. It should stretch you and guide you while helping you determine what to say yes and no as you progress to accomplish your goals. A BHAG can also be a personal vision statement. Where do you see yourself in 5 or 10 years? What are some bold or daring things you’d like to accomplish? These two types are not necessarily walking together, but they seem to work pretty well as a couple, so I decided to put them side by side. Stretch goals inspire us to think big and remind us to focus on the big picture. They require extending oneself to the limit to be realized. They represent a challenge that is significantly beyond the individual’s current performance level. Stretch goals energize and push you to work smarter and harder at meeting what seems to be more difficult targets and to achieve more than if you had set an easier goal. When you set a stretch goal for yourself you know that you may not meet it 100%, but by moving in this direction you will likely achieve extraordinary results. Now, the way to achieve your stretch goals can be by using S.M.A.R.T. goals. The acronym SMART stands for goals that are Specific, Measurable, Achievable, Realistic, and Time-bound. They help us form a plan of actions in order to make the stretch goal a reality. Specific – exactly what it is that you want to achieve. Measurable – you must be able to track progress and measure the result of your goal. Achievable – you should see the way to achieve your goal by making certain steps. Realistic – the goal should be realistic and relevant to your stretch goal. Make sure the actions you need to take to achieve your goal are things within your control. Time-bound – your goal must have a deadline. SMART goal setting brings clarity, structure, and trackability into your goals. Strategic goals are goals that you want to achieve over a big period of time (two years, five years, ten years, etc.) usually following a strategic plan. They are aligned with your vision and mission, considering your strengths and weaknesses, opportunities and threats. Objectives are specific goals that help us achieve our big goals. They make it possible to move ahead and if you complete your objectives, they will contribute to the achievement of the larger strategic goal. There are many other types of goals that you may have heard of and there are such you most probably have not. For example, different goal types can be defined by different areas in life – financial goals, health goals, contribution goals, personal growth goals, family goals, business goals … well, you get the idea. They are specific just by the area of life and are not (but can be) defined by their size (big/small) or time period (long/short). Not so popular types are: Passive/Active Goals (if you wonder, passive goals are when you have to resist doing something), Sub-Goals/Main Goals, Negative/Positive Goals (or the so-called “fight or flight” goals, although I really can’t get the idea of following a negative goal, but that’s another conversation), Mental/Emotional/Physical Goals, Temporal/Spatial Goals, Personal/Social Goals, Single/Multiple Goals, Certain/Possible/Impossible Goals, Achieved/Aspired Goals, Old/New Goals, Easy/Difficult Goals… etc. As you can see there are really too many types of goals and it’s not hard to get overwhelmed and confused. Especially if you just want to set your goals and start achieving them instead of going into thousand theories and ideas how to define and divide them. Let’s see how different types can be combined and simplified so we can have a powerful and simple definition that will help you move forward and achieve the goals instead of getting into analysis paralysis. Now let me first present you the two types of goals and then show you how the other types that I mentioned above can fit them. This way, by having only two types, you will have a clear and simple start for setting your goals. A vision for an area in life is not easy to be measured or can’t be measured at all. In fact, it is not necessary to be measured and you don’t need to try. A vision doesn’t need to be specific and simply gives an answer to the question “what”, i.e. defines the desired result and does NOT answer the “how” question. To define a vision you “just” need to know what you want to have/achieve/be. This type of goal defines an area of your vision for the future in the next 2-5-10-25 or more years. 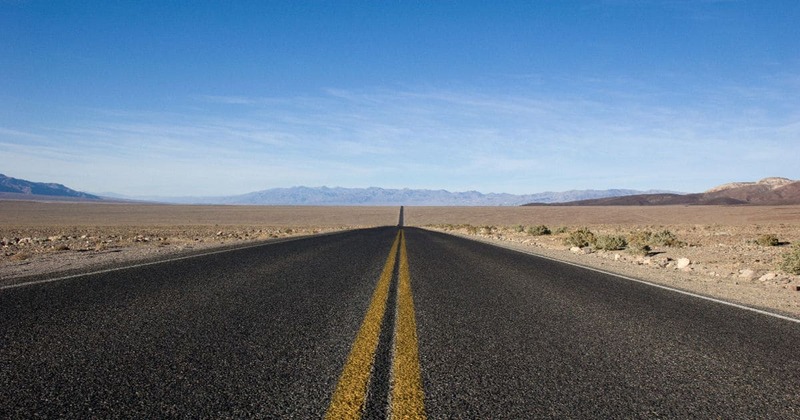 It is also possible that the vision is “endless”. You may have absolutely no idea how to go for it and initially, it may seem impossible to be achieved. Visions’ purpose is to give you direction about how you want to live, grow and make the world a better place. The thing is, it may not be very easy to define it, especially in the beginning. To do that you will need a lot of clarity about what you want in your life. If you’ve never done it before, my advice is to start with 2-5 year vision and then, when you make annual goals review, adjust and extend your vision until you reach 20-25 year vision. One thing that can help you is answering the question “what will not change in the next 25 years?”. What are the things in this so rapidly changing world that you want and will always want? Love? Peace? Wealth? Think about it. If you have a clear investment strategy for the next let’s say 20 years, the investment products you will buy and you have done the math to reach the desired result then your path is clear. This doesn’t mean you won’t change the strategy or investment products over the years, but it means that from the current perspective it is quite clear how you’re going to achieve it. In one sentence: Visions represent your vision for future life and describe what you want for the next X years. An action goal is what you need to achieve in order to make the next big step towards your Vision. In the best case, it is a 90-day goal, i.e. you make a plan to achieve it in 90 days. The set of action goals (even if it’s just one) is what defines your strategy. Or the other way around – if you have a strategy for achieving/advancing on a Vision, then Action Goals are the stepping stones you are using in order to move towards it. Those stepping stones may be a finite or infinite number. You may see them in the distance far ahead like a trail or they may be shrouded in fog revealing each next one only when you step on the previous. Action Goal is what you define your next action steps for. – End goals – Experiences, Growth, Contribution – all those are not measurable. You define what you want and don’t try to answer how they are achieved. Matches vision perfectly. – Long term goals – “I want to be a millionaire in 20 years”, “I want to build/buy my dream house in 5 years”, “I want to get married and have a family with many kids in 10 years”. They are long term and define a vision for the big things in your life. – Stretch goals – as you already know those goals are something that you have no idea how to achieve and they are outside your comfort zone. That is what you dream for but it is kind of scary to go after it. In other words, that is what defines your vision for a dream life. – Ideals – those are the ideals about how you want to grow, live, make the world a better place. Again – a vision for your life. – Means goals – these goals are a tool for achieving the end goals. In other words, you know how to achieve them and they require action. – Short term goals – well, short-term goals are usually easy to understand and thus easy to follow. What you need is to take action. 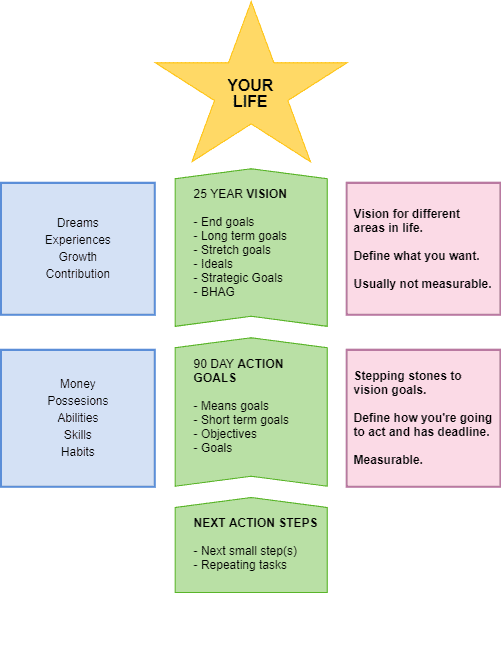 – SMART goals / Objectives – specific and measurable goals that are time bounded. And in order to meet the deadline you need to make the necessary actions. after so many said it’s time to summarize. Thinking in the terms of and setting many types of goals can lead to confusion and frustration. And what’s worse it may prevent you from achieving what you want. You can make things simple and stick to only two types of goals: Visions and Action goals. Visions define what you want for different areas of your life and action goals define how you are going to progress on the visions.